Coarse fishing is the term used to describe fishing in fresh water for any species of fish except salmon and trout. It is a sport for every person of any age and can be enjoyed by oneself or with friends throughout every season. Before going fishing the angler must buy a rod licence, this can be obtained from post offices. A licence can also be purchased online by visiting the Environment Agency's website. There are plenty of stories about catching fish with a bent pin, a worm and a piece of string. While some of these stories may be true, the novice angler will have a better chance of catching a fish by using slightly more sophisticated equipment. A visit to the local tackle shop, or as they are sometimes called "Anglers' Centre", may initially be a daunting and confusing experience when faced with the vast array of equipment on display. A question that might spring to mind could very well be, "where on earth do I begin?" Well, to get started, the equipment does not need to be too expensive or even too complicated. Here is the basic tackle needed: rod, reel, line, floats, split shot, hooks and bait. Owners of tackle shops are usually keen anglers and can offer helpful advice and guidance when choosing equipment; after all, they want you to be a future customer! They can also tell you where you are allowed to fish. Fresh water venues for fishing include rivers, streams and becks as well as still waters such as ponds, lakes, quarry pits and canals. Okay, you've had to buy a rod licence and that gives you the right to use a rod and line, however, the licence does not give you the right to fish! Although there is a limited amount of "free water" where you can fish without permission, most of the fishing rights on freshwater venues are held by fishing clubs and associations or are owned by private estates. Joining a fishing club will give you access to water that is usually well stocked with fish on a regular basis. 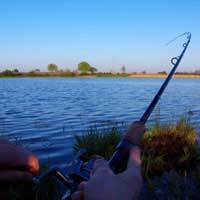 If you are unsure whether angling is the sport for you then buying a day ticket for club water or fishery would provide the opportunity to experience coarse fishing. Tackle shops and Tourist Information Centres can provide addresses and information. All waters, except those that are seriously polluted, will hold fish. There is a general rule: the larger the environment then the larger the fish! So, for instance, lakes and wide, deep rivers would expect to yield the bigger species of fish such as pike, carp, barbel, bream and chub. In becks, streams and ponds relatively smaller fish like dace, roach and perch would be found. Of course, there are always exceptions to a rule and this is what makes coarse fishing exciting because there can be totally, unexpected catches! Put very simply, the fish has to be tempted to take the bait on the hook. But what bait to use? The traditional bait has been the garden worm and with maggots these are still the most favoured baits. However, there is plenty of produce in the kitchen cupboard such as bread, cheese, sweet corn, luncheon meat and even sausage that will tempt a fish. It's important to remember that fish are wild animals and so are wary, cautious and have an instinct to survive. Approach the water without banging about otherwise vibrations will alarm the fish. Also, don't make yourself into a stark profile on the bank but rather blend in with the surroundings. And finally, be patient. Yes, sometimes a fish can be caught on the first cast but at other times it can be a waiting game. Certainly it's very exciting to strike into a fish and watch the rod bend and feel it tremble and then to admire the perch or dace or rudd or eel on the end of your line. But there's also the peace and tranquillity of just being next to water that can be therapeutic and calming. The first glance of a kingfisher is never forgotten nor is the music of flowing water. The angler is a lucky person to be an integral part of nature and sometimes catching a fish is just a bonus.